Paul Warne has revealed why he’s been prepared to bide his time before kickstarting Rotherham United’s summer recruitment in earnest. The Millers have brought in only one new player since their relegation from the Championship last season. But that is about to change, with the Rotherham boss predicting there could be three new signings - a striker and two midfielders - next week. Warne has been happy to wait to make sure he landed the right men for the Millers’ League One campaign next year. “I appreciate that there might be a little frustration that more haven’t come in,” he acknowledged. “But I don’t bring 18 players in; that’s not how I work. I bring players in who I think are perfect for the club. That takes a lot longer. Warne, just back from a 16-day UEFA coaching course in Belfast, says negotiations are at an advanced stage in all three cases. Striker David Ball, who is out of contract at Fleetwood Town, and midfield man Darren Potter, who has left MK Dons, are likely to be two of the recruits. 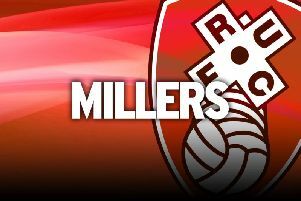 The Millers’ only new recruit so far has been former Tranmere Rovers centre-half Michael Ihiekwe, although central defender Richard Wood, left-back Joe Mattock and centre-forward Jonson Clarke-Harris have all signed new deals to remain at New York Stadium.